Over the last few years, the O.J. Simpson case, then the Lewinsky-Clinton affair, and scores of minor scandals have dominated the US press, often taking precedence over important domestic and international issues. This tabloidization of the news media, both here and abroad, has proved that "the market" cannot insure media quality. In a democracy, for media to function well, they must be free of both political and economic muzzling. The only solution is to add self-regulation, or quality control, by professionals and public to the other two forces, the market and state regulation. 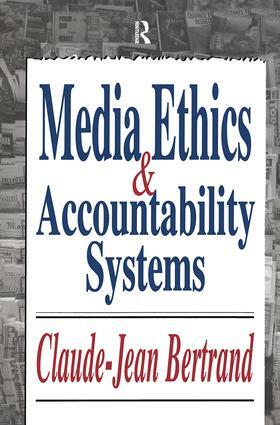 In this controversial volume, Claude-Jean Bertrand sets out to define a set of accountability systems--democratic, efficient, and harmless--to insure true freedom and quality of media. This brief, highly literate volume focuses not on philosophical foundations of media ethics or case stories, but on what is now missing in the codes. Many books deal with media ethics but few deal with accountability. Media Ethics and Accountability Systems zeroes in on the many nongovernmental methods of enforcing "quality control," and on the difficulty of getting the media microcosm to accept such accountability. To remedy this lack, Bertrand proposes rethinking existing "media accountability systems," some 30 to 40 in number, and creation of new ones. He observes that existing systems are rooted in four basic approaches: training: the education of citizens in media use and the incorporation of ethics courses in journalistic education; evaluation: criticism (positive and negative) not only from politicians, consumerists, and intellectuals, but from media professionals themselves; monitoring: by independent, academic experts over extended periods of time into the long-term effects; and feedback: giving ear to the various segments of media users and their needs and tastes, rather than scrutinizing sales and ratings. Media Ethics will be of particular interest to academics in the fields of communication and journalism, as well as to the general reader with an interest in public issues and a civic concern for society.